Set in the decades leading up to the French Revolution, this is a story of two women: Emilie du Chatelet, the love of the famed French writer and philosopher Voltaire, and the daughter she died giving birth to, Stanislas-Adelaide (known in this story as Lili). 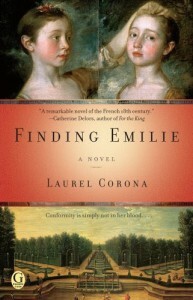 Shorter chapters are set throughout the book to give us a glimpse and understanding of Emilie’s life and why she chose the path that she did. These anecdotes are needed to reveal how the lives of mother and daughter parallel. Lili’s need to know her mother and the unusual life she lead–information which was being kept from her by her father’s bitter sister-in-law, who ultimately has Lili’s future in her hands–is the keynote to her future happiness. Though she has to endure visits to her aunt, Lili is raised by a dear friend of Emilie’s–Julie de Bercy–who does her best to instill the intelligence and grace of her mother, while nurturing her love of writing and science. Julie’s daughter, Delphine, born just months after Lili was like a sister to her and together the girls go from convent school to Versailles to be presented the queen consort Marie Leszczynska. In an age where women are not given credit in their own right, Lili finds her philosophical works will only be published under a pen name. It is the beginning of the stirrings of revolution, as the lower orders are becoming increasingly unhappy with their lives and enlightenment is spreading to the populace. Though the story ends before the French Revolution, every theme points toward the impending political upheaval. Mid-Eighteenth Century France, an era that boasts few historical novels, Finding Emilie is a must for well-rounded fans of the genre. Historical figures such as Voltaire, Buffon, Philidor, Diderot, Maupertuis, Richelieu, Rousseau, and Turgot are background characters or mentions. There is a pronunciation guide which is very helpful, along with a sample of Lili’s writings, a reader’s guide and an author’s note in the back of the book. This is a very well researched novel and an easier read than one might think with such personages and subject matter depicted. Anyone interested in the history of France, the Age of Enlightenment or the precipice of the French Revolution will absolutely love this book!